Food blogging has its perks. Sometimes, people offer to send me cookbooks. Sometimes, I find recipes in said books worth sharing with you all. This recipe, by Gena Hamshaw of Choosing Raw and the author of Food52 Vegan: 60 Vegetable-Driven Recipes for Any Kitchen, is one of them. 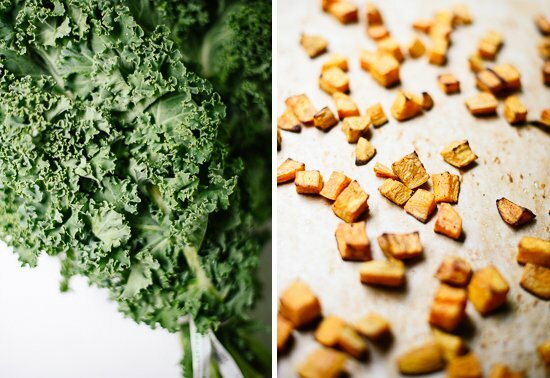 This recipe jumped out to me since savory sweet potatoes, kale, quinoa and pesto are a few of my favorite ingredients. It also seemed like a salad that would pack well for yesterday’s flights, and it did. I feel so accomplished when I arrive at the airport with a healthy meal in tow. Which, to be clear, is almost never. It’s a miracle when I remember to bring socks! I found the final kicker in Gena’s headnote, which suggested that this is a salad for August or September, when basil is plentiful at farmers’ markets and sweet potatoes are just becoming available. Since September is almost over, I thought I’d better hurry up and make it. I’m generally inclined to throw feta or goat cheese into my salads, so this salad was an exercise in restraint for me. I was also tempted to toss in some dried cranberries, too, or substitute pepitas for sunflower seeds, but it’s honestly just right as is. Note to self: less can be more, especially when an outrageously flavorful pesto-inspired dressing is involved. I’m exploring the Pittsburgh area today with DeLallo and friends, so I’m signing off early. 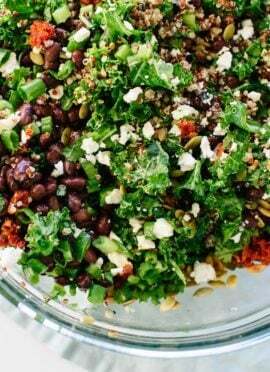 Be sure to let me know what you think of this salad and check out Gena’s book, Food52 Vegan, if you’re interested in vegan cooking or looking for dairy-free inspiration! 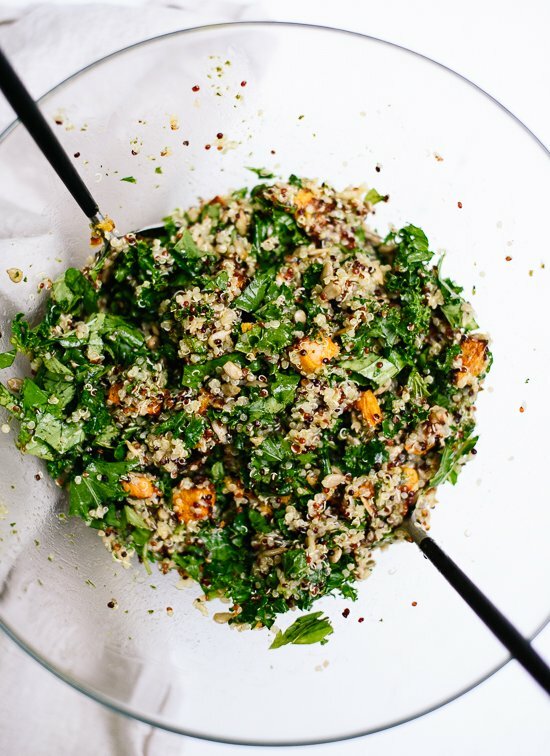 This hearty vegan quinoa salad features crisp and tender roasted sweet potato, toasted sunflower seeds and an outrageously flavorful, pesto-inspired dressing. It would be a great light dinner on its own, or a suitable side salad for soups and sandwiches. It packs great for lunches, too! Recipe yields 4 medium servings. Preheat the oven to 425 degrees Fahrenheit. Line a large, rimmed baking sheet with parchment paper for easy cleanup. 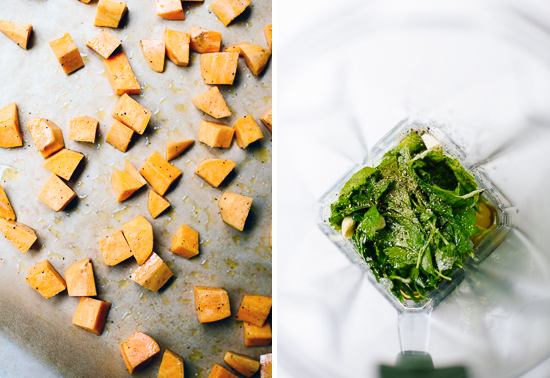 To prepare the sweet potatoes, transfer them to the prepared baking sheet and toss them with 2 tablespoons olive oil. Sprinkle with salt and pepper and arrange in a single layer. Bake for 10 minutes, then toss and bake for 10 to 15 minutes longer, until tender and browning. Set the pan aside to cool. Meanwhile, combine the rinsed quinoa and broth in a medium saucepan. Bring the mixture to a boil over medium-high heat, then decrease the heat to maintain a simmer, cover, and cook until the quinoa has absorbed all the liquid, about 20 minutes. Fluff the quinoa with a fork and set aside to cool. To make the vinaigrette, combine all of the ingredients in a blender or food processor and process until mostly smooth, but with small pieces of herbs still visible. 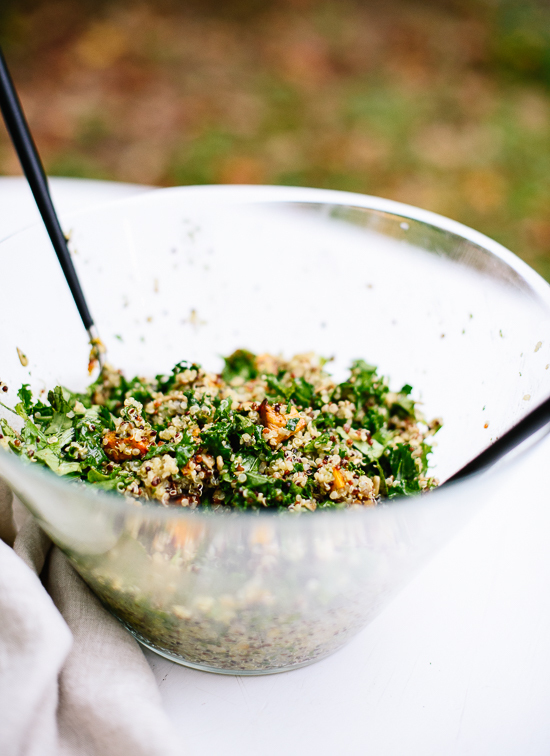 Transfer the chopped kale to a large serving bowl. Sprinkle with a dash of salt and then use your hands to “massage” the kale, grabbing big handfuls at a time and gently squeezing them in your fist until the kale is darker in color and more fragrant, about 15 seconds. 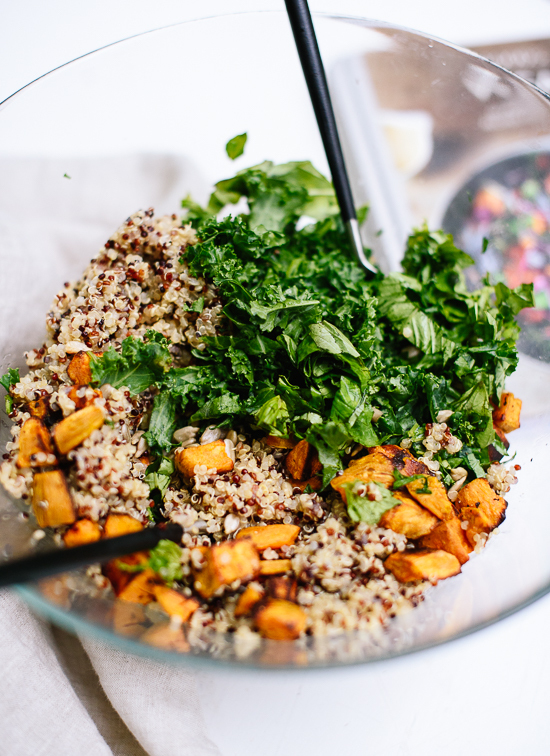 Add the sweet potatoes, quinoa, kale, sunflower seeds and sliced basil to the bowl. Drizzle with about ⅓ cup dressing and gently toss until all of the ingredients are evenly coated. Taste and mix in more dressing if desired. Serve the salad at room temperature or cold. Leftovers will keep well in the refrigerator, covered, for up to 2 days. 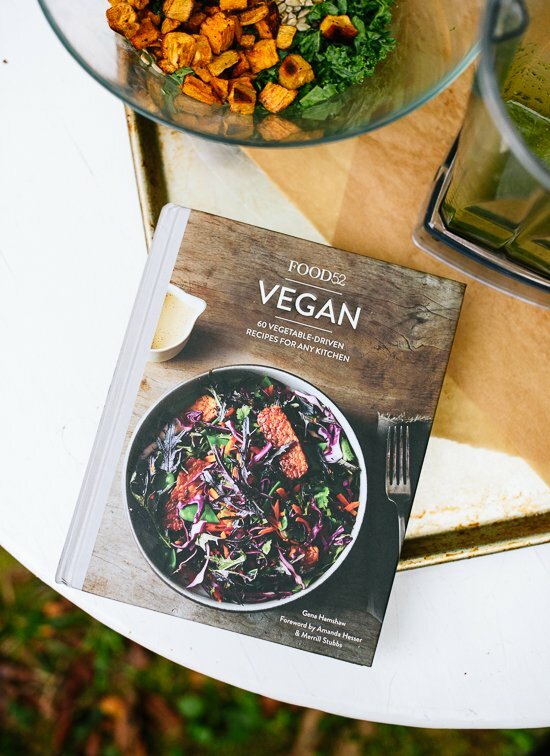 Recipe reprinted with permission from Food52 Vegan, by Gena Hamshaw, copyright © 2015, published by Ten Speed Press, an imprint of Penguin Random House LLC. Change it up: Butternut would be a great substitution for the sweet potato, as would pepitas for the sunflower seeds. *How to toast your own sunflower seeds: If you only have raw, unsalted sunflower seeds at home (like me), toast them in a small skillet over medium heat with ¼ teaspoon olive oil and a pinch of salt. Cook until they’re turning lightly golden on the edges, stirring frequently, about 5 minutes. Great combo of ingredients in this salad! I love pesto…and can’t wait to try this one with a wee bit of maple syrup in it! Have fun in Pittsburgh!! My copy of this book just shipped today and I can’t WAIT for it to get here, eek! Have fun on your trip Kate! That quinoa salad looks amazing. Adding it to my menu plan for next week right about now. Thanks for sharing. That looks perfect for a plane ride. Enjoy Pittsburg! That looks so, so good. I agree, all the best ingredients. Your blog introduced me to the wonder of sweet potatoes with your fry recipe, so I’m excited to try this. Thank you, Kate! I hope you love it! I’ve made kale pesto before for pasta but hadn’t thought of an herbal pesto for a warm winter salad – love this twist on classic ingredients. Thanks for sharing (and I may just have to buy the book for my vegan sister)! This salad looks divine! 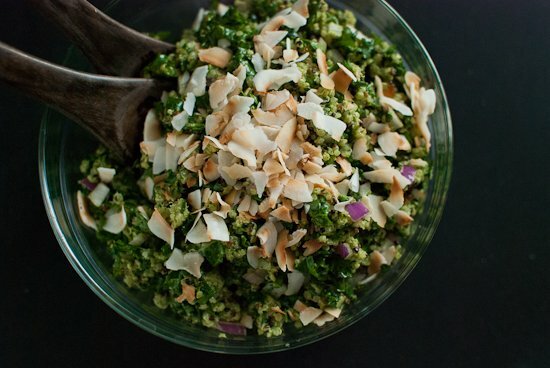 Kale and quinoa taste so delicious together! Thanks, Emily! Hope you love it! I just made this today and it is delicious!!! I kept the sunflower seeds out and sprinkled them on top when serving so they don’t get soggy. Thank you for such a great recipe! Thanks, Jan! Glad you enjoyed it! I made this for a party for our fitness trainer and everyone loved it, including her. I skipped the maple syrup and it was delicious. What sets this apart is the pesto dressing, the herbs really add flavor instead of just a basic vinaigrette. Delicious! Thanks, Bonnie! So glad you enjoyed it. 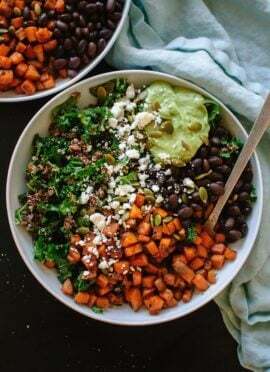 perfect fall power salad! making this ASAP! I’ve got most of these ingredients in my kitchen so I’m definitely going to try this fabulous recipe. I am an American following your blog…in Italy…where I find vegan cooking to be a bit boring. Today I served the quinoa salad with kale, sunflower seeds, etc. and the pesto dressing to a friend who is very particular…she had seconds! The salad is a burst of flavors and textures, perfectly seasonal in composition, and colorful almost to a fault…if that is possible. It married well with my carrot and ginger soup, seasoned with tumeric, cooked with rice and then blended. The table looked great…but I forgot to take a picture. Sorry. This recipe is a winner. Thanks for including it in your blog. Another great dish. Your recipes are so easy to follow and this was another crowd pleaser. The vinaigrette was to die for! Love that I don’t have to buy a thousand ingredients for amazing dishes. Thank you, Kate! I made this on Friday and it was excellent. Thank you, Winnie! Happy to hear it. I made this last night and LOVED it. Your recipes always end up as good as they look online Kate, a very dependable source for yummy meals you are. Thanks for all the great meals you’ve helped me make! Delicious!! I just made this for the first time today, and it’s definitely going to be in a steady rotation for my lunches from now on. Thanks for a great recipe! I am always in search of new quinoa salad recipes. The flavor combination is delicious! This recipe was fantastic! For the dressing, I had homemade basil pesto from this summer that I added a little more oil, lemon juice, and maple syrup to give it a thinner consistency. And I used toasted pine nuts instead of sunflower seeds because I had them. It was a great combination of flavors. Thank you for the recipe! Thank you, Diane! Glad to hear it! Hi Kate! I’ve really enjoyed several of your recipes so far!! Thanks so much for your yummy creativity!! I have a question…I’m temporarily needing to follow a nonfat diet right now due to a current gallbladder attack. Are there any recipes off the top of your head that you can steer me to on your blog? I’m trying to avoid all oils, nuts, seeds and generally trying to have nonfat dairy (or only small amounts of low fat) until this episode subsides. If you have the time to recommend something on your blog, I’d appreciate it very much! Hi Perla! I’m so sorry I didn’t answer your question sooner. I use oils and seeds/nuts pretty liberally, so I’m trying to think of some recipes that would work for you. I think you’d have good luck with this super basic burrito bowl. I think that my vegetable soups like this quinoa soup could easily be fat free. Just sauté the onions and aromatics in some vegetable broth or water instead of oil. You might like to make a big batch of fresh, flavorful mango salsa or something similar and use that to add tons of flavor to salad greens, or as the filling in bean burritos and whatnot. Good luck and hope you feel better soon! My husband’s family is having an early thanksgiving tomorrow, and as a vegan I wanted to bring something tasty for them to enjoy. I just made this and it is AMAZING! It will be hard to not eat it all before the dinner tomorrow. Thank you!! Pesto is one of my favorites — and it’s the perfect touch to an already great recipe! I made it for supper tonight, and I know it’s going to be a regular in my weekly eats. Delicious!!! I omitted the syrup, and put the seeds in with the pesto (toddler can’t eat whole seeds yet). We all loved it, especially our toddler who said “mmmmmm, yum yum” a million times while gobbling it down. I will definitely make this again! I made this for dinner last night and it was amazing! So flavorful and delicious, my whole family loved it. Will definitely be making again and again! I have to tell you, Kate, that every time I get online looking for a recipe for anything– I always end up choosing the one on your website! You have truly inspired my cooking and have made many happy tummies of my friends, coworkers, and family!! P.S. I especially like your after notes on how-to’s and substitutions. So thoughtful! This salad was super delicious, Kate! I can’t stop eating it––good thing it’s so healthful! I didn’t have any basil so I made this with a parsley-only pesto. It still turned out amazingly well and was difficult to stop eating even when I was full. I followed your advice for making fool proof quinoa and was so impressed with the result! Thanks for that. I served it with the dressing on the side because my 8 yr old preferred it without. It’s delicious either way! Like the previous reviewer, I had no fresh basil, nor did I have parsley, so I instead substituted cilantro into the dish and actually used lime instead of lemon and it still turned out exceptionally well. I’m mainly cooking out of our garden right now and we have tons of kale. Lucky me- I can make this dish over and over! My meat & potato man loved it, going for seconds which is always a sure sign that a vegetarian dish is a winner! :) Thanks for another lovely recipe Kate! I like your idea about subbing butternut squash and/or pepitas too. LOVED IT! I made tonight for dinner and my friend who has been trying out all your recipes said ” I think this might be the best so far, and they have all been so good”. Made it exactly as stated and cannot get enough of you. I am a giant Ina Garten fan and you are the healthier version of her – keep on keeping’ kate. I made this last night for a few dinner guests, SO AMAZING. I didn’t alter the recipe and fought the temptation to add feta – it was worth it. Definitely keeping this one saved….. Tried the pesto vinaigrette on homemade bruschetta – fresh bakery ciabatta with tomato, mozzarella and pesto. Wonderful!! Loved the lighter pesto without pine nuts and parmesan cheese. and THEN, my daughter said that had some while I was at work and she LOVED it! She just packed a bowl and took off to go write somewhere. I’ve never had lots of the vegetable-ish kinds of foods that you make. So, maybe that’s why it took me around 90 minutes to make this? And then it all gets eaten in 8 mintues! >0[ Maybe if I had all my veggies washed and ready to go, it’d make a big difference? It would help a lot if I could come over and watch you make something. I’ll bring pie. I made this tonight and am eating it right now. It’s so yummy that I couldn’t wait to comment. The dressing is so good, and all the flavours of everything just meld so nicely. I found the amount of quinoa was too much, so I used a little more than half and saved the rest for another time. I added feta, which was perfect. I couldn’t find sunflower seeds at the store (I live in NZ) so I bought pine nuts and toasted them. Ah-MAZING. My meat-and-potatoes hubs even enjoyed it. Thank you for this keeper of a recipe. Do you think Swiss chard would work for this salad? I absolutely loved this salad. My coworkers were put off by the color but I insisted that they try it. Once they did, they were begging for the recipe. Thank you for all your tasty dishes. Your site is my go to when looking for my meal prep ideas ! Oh, I’m so happy you shared this with friends, too! I’m glad you all enjoyed it. Kate! I am hoping to make this tonight but wondering… for the 2 medium sweet potatoes, do you mean 3/4 pound total or 3/4 pound each? Christina, I’m sorry, that is confusing. I just cross-referenced with another recipe and I believe it should be about 3/4 pound total. This was our go-to recipe all summer long – I think we had it at least twice a week. We have three teenagers – and often have a lot of their friends for dinner, too. This is a hit with the pickiest eaters. This is the salad that convinced my 16 year old daughter that kale is actually really good, and that sweet potatoes are even more delicious than regular white potatoes. We dubbed it “the summer of health and fitness” and this was a big part of our healthy routine. When I have to bring something to a potluck, this is what I bring. And I always get raves. And tonight’s the first night everyone is home for spring break. Guess what they requested for dinner? Yup! Sounds like you have a busy household with lots of hungry folks in it, Nannie! I’m happy this fits the bill. Thank you! I’ve rewritten this comment 3 times, each time not able to fully express just how grateful I am for having stumbled upon your blog a month ago. It has completely changed my thinking about certain foods and cooking in general- to say I love your recipes is a huge understatement!! I have been making your meals every night and just received your cookbook in the mail today; I’ve been pouring over it while devouring one of your quinoa salads. Hee Hee… I’ve been enthusiastically telling my friends and family about your site and book- thank you so much for all your hard work in developing such beautiful, delicious and healthy recipes! Please keep up the fabulous work!! I anxiously await your next cookbook!!! Thanks, Jeanne! So glad you loved it. This was absolutely delicious! Made this the other night exactly how it was written and we enjoyed it and its a keeper! I have tried many recipes on your site and they are all delicious and easy to understand. Thanks for some yummy dinners! Thank you, Susan! That’s wonderful to hear. I try to keep my recipes simple and easy to follow, so it’s nice to hear I did just that! I adjusted the recipe slightly so that it more closely resembled a budda bowl rather than a salad (as I eat kale salads so often!). I used a little of the dressing to massage the kale and then to season the quinoa. Then I layered it like a budda bowl. Starting with the kale base, a little pile of quinoa, and a little pile of the roasted sweet potato, and topping it with sunflower seeds. I found I used less dressing this way, but still got all the flavors. I think next time I’ll add plain cooked lentils and a tangy cashew yogurt sauce. Your version sounds great, Sophia! Thanks for taking the time to comment. Have used lemon juice, this time lime …either a hit! The most delicious salad I’ve had all year! The dressing is amazing. It keeps really well I just added a bit more dressing the next day. Thank you, Veronica! It is a great combination. I appreciate your review. I made this and turned it into a “warm kale, quinoa and sweet potato salad” by sautéing the kale first. I also used Kate’s kale pesto since it’s winter and basil is expensive this time of year. Turned out AMAZING! Great! Thank you, Allison for sharing and for the review. okay, this recipe is MAGIC! I feel like a professional chef when I make this salad. it is genuinely soooo yummy, and I feel fresh and full after eating it, not heavy and gross. I actually don’t like pesto so I toss the massaged kale with a whole lemon + some olive oil before I add the quinoa & sweet potatoes, and I also don’t let the quinoa cool entirely because when I add it warm it cooks the kale JUST a touch. thank you sooooo much for this! LOVING it! I’m glad you feel successful! Thanks for sharing, Bianca. :) just ordered your cookbook. so excited! This was sooo good!! I made this on Thursday…how many days in the fridge would it keep? And can this be frozen? I’m not sure on being frozen, Christy. But, you could try it. I would question the consistency once thawed. It should keep well in refrigerated for a few days. Just a question – the pesto vinaigrette makes 1 1/2 cups, but for 4 servings, you recommend using about 1/3 cup dressing. I have a jar of pesto left to use up, so I should use around 1/3 cup for the recipe if I use that instead of the dressing you provided & keep the other ingredient amounts the same? Would you recommend thinning out my store-bought pesto at all – how thin is the dressing in this recipe? It depends on how thick the store bought is. This one is a vinaigrette, so it likely isn’t as thick the one you have. You can add a little oil to it to get it to a consistency it can easily be mixed with the dish. Hope this helps! Had to reply & comment with how it turned out. My basil plant ended up producing enough basil for me to use in a half dressing recipe and I used all basil instead of parsley + basil. This salad was great! My husband calls any dish I make that doesn’t contain meat a “side dish”. So I cubed up some cooked chicken from the freezer which I had left over from a soup I made. It blended seamlessly. He said, “It’s a side dish plus” — high praise from him. This dish is absolutely delicious–another winner posted by C+K. THANK YOU! I’m glad this was a step-up in his book! Thank you, Lydia for sharing. I appreciate the review! Are there are other vinaigrettes that would work well with this power salad or can you use ready made pesto to dress up the salad? 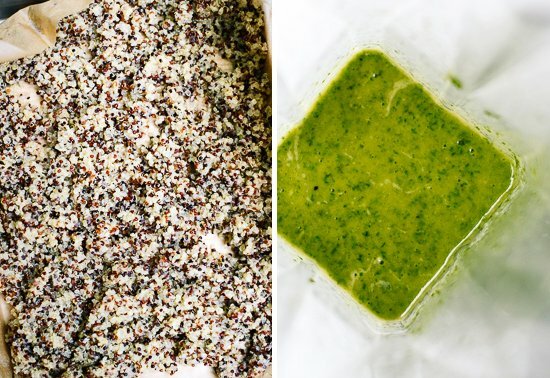 You can use store bought pesto, if you like. You might want to add extra olive oil depending on the thickness of the pesto. Hope this helps! How many calories per serving on this? ?